The Centre for Climate Risk and Opportunity Management in Southeast Asia and Pacific (CCROM SEAP) at Bogor Agricultural University (IPB) in close collaboration with the Deutsche Gesellschaft für Internationale Zusammenarbeit (GIZ) GmbH – Germany hosted three days workshops from 1 – 3 October at Novotel Hotel Bogor, Indonesia, called Facilitation Workshop as forms part of Climate Leadership Plus - a leadership for global responsibility program. The objective of this workshop is to provide a better understanding of the specific characteristics of the facilitation of a leadership program. This will be reached by sharing insights about lessons learnt of the previous CLP-programmes. 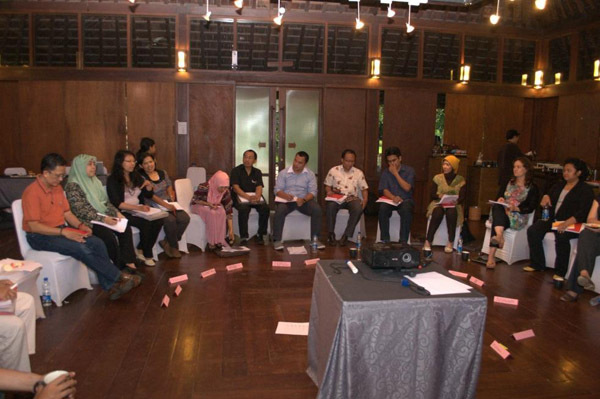 The workshop will combine the exchange of know- how with other facilitators with the practical experience in the application of innovative facilitation tools and methods suitable for leadership development programs. This workshop was run by an international facilitator specialized in leadership development and former main facilitator of the CLP-programmes 1 and 2. The facilitation workshop has the additional purpose to find talented facilitators, who have the capacities, competencies and interest to cooperate in CCROM- SEAP and GIZ future leadership programs, in particular the National Climate Leadership Plus (I-CL+) Indonesian programme “Collective Leadership for Sustainable Natural Resource Management under the Effects of Climate Change”. This leadership programme will be held from January - May 2014 with three 2-3 days workshop sessions and intermediary activities.